The film ‘Hugo’ directed by Martin Scorcese stretches the frontiers of cinema, it weaves a fine narrative style with innovate camerawork – an early shot is a longish one which traverses briskly along a crowded marketplace and culminates in a wall clock, the film is rife with such unusual shots quite a few of which are aerial zoom-ins. 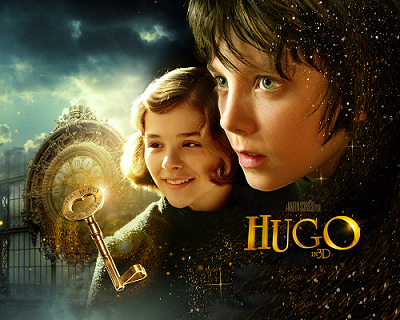 It revolves around a small boy who lost his inventor father (Jude Law) and his arduous struggle thereafter; he becomes a petty thief with the great ability of fixing machines, an inherited skill from his dad who died in an accident. He incurs the wrath of a toy shop owner (Ben Kingsley) who forcibly snatched his ‘notebook’ with a promise to return it if he puts in sufficient work at his shop to compensate for the items he had pilfered from the shop. Through flashback, it is revealed that Ben Kingsley was actually a good magician who thereafter became the very pioneering and celebrated filmmaker George Melius and made several landmark films together with his actress wife, who doubled as his ‘muse.’ The film touches science fiction (the robot like Automaton is simply great), philosophy (the boy is shown discussing philosophical significance of his life with his girlfriend), film restoration, societal indifference to great artists. This is simply a very different Scorcese that we’ve seen (Taxi Driver, Raging Bull) in the past, but he simply wows us with this one… The acting is commendable. Sir Ben Kingsley gives another sterling performance. The protagonist kid (Asa Butterfield), his assistant and girlfriend(Chloe Grace Moretz) & Mrs Melius (Helen McCrory)are all hugely likeable -even the comical and vigilant cop (Sacha Baron Cohen) with a dog always hounding our small hero, putting him inside a cell on an occasion & who undergoes a transformation at the end make the proceedings lively.